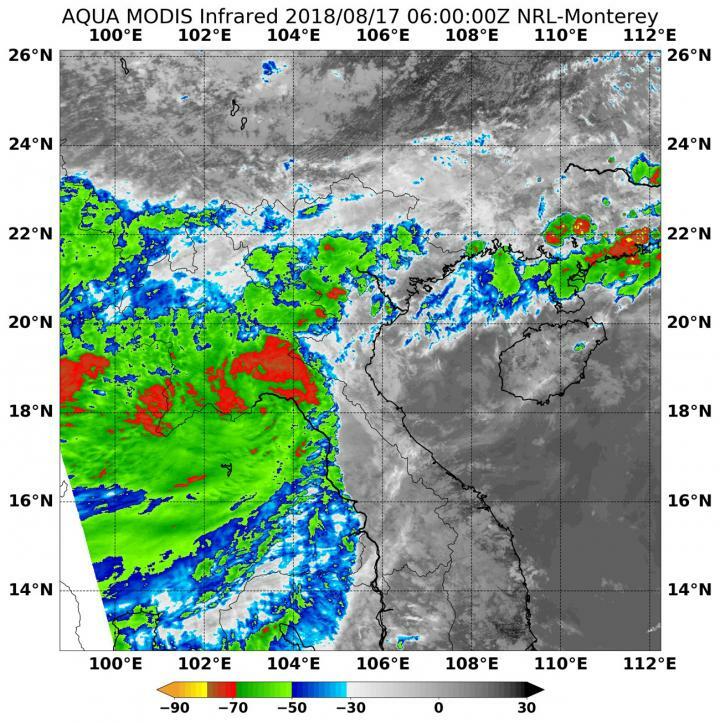 NASA's Aqua satellite found strong storms circling the center of Tropical Storm Bebinca as it moved over northern Laos and into Thailand on Aug. 17. At 11 p.m. EDT on Aug. 16 (Aug.17 at 0300 UTC), the Joint Typhoon Warning Center or JTWC issued the final bulletin on Bebinca. At that time, the center of the Bebinca was located near 19.4 degrees north latitude and 105.5 degrees west longitude. At that time, the center of Bebinca was about 99 nautical miles south-southwest of Hanoi, Vietnam. Bebinca's maximum sustained winds at that time were still 57 mph (50 knots/92 kph). On Aug. 17, the Laos Department of Meteorology and Hydrology (LCMH) issued various warnings and watches throughout the country as Bebinca moves through. Details can be found at: http://www.newcdmh.com/newc/. On Aug. 17 at 2:00 a.m. EDT (0600 UTC) the Moderate Resolution Imaging Spectroradiometer, or MODIS, instrument aboard NASA's Aqua satellite analyzed Tropical Storm Bebinca's cloud top temperatures in infrared light. Infrared data from NASA's Aqua satellite provided forecasters with temperature data that showed strong storms still lingered within the weakening tropical cyclone. MODIS found cloud top temperatures of strongest thunderstorms around Bebinca's low-level center were as cold as or colder than minus 70 degrees Fahrenheit (minus 56.6 degrees Celsius). Cloud top temperatures that cold indicate strong storms that have the capability to create heavy rain. Bebinca is forecast to track further inland across Laos and northern Thailand, before finally dissipating.